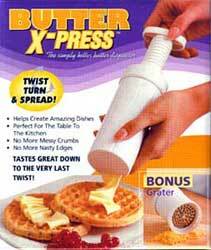 Butter X PRESS quickly and easily dispenses a thin ribbon of your favorite spread. Great with Butter, Margerine, Cream Chese, Peanut Butter, Soft Cheese, Frosting. Just twist and spread. 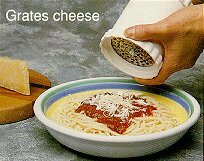 Great for toast, making delicious garlic bread, waffles, herb potatoes, vegetables, corn, and more. Winner of the American Culinary Gold Meday Award of Excellence! Handy Tips and Treats Booklet Order today!